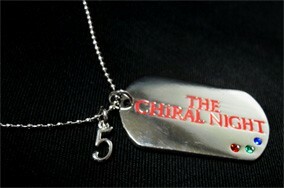 The perfect accessory to commemorate 5 years of CHiRAL NIGHT. Embedded with 3 differently colored stones to represent "TOGAINU NO CHI," "Lamento -BEYOND THE VOID-," and "sweet pool." Includes "5" shaped charm to represent all 5 years. Necklace chain adjustable to become between 50-55cm.